Kate Van Winkle Keller, the author of this book, is a well known expert in early dance and music, with a long and distinguished career as a consultant for many organisations and individuals such as composers, archivists, scholars and collectors. She specialised in early American music and dance manuscripts; has written and published numerous articles and books on these and related subjects, and was a contributor to various high profile publications, as, for example, The American National Biography and the Encyclopedia of the North American Colonies. Her name is also connected with important scholarly organisations, like the Society for American Music and projects such as The Performing Arts in Colonial American Newspapers, 1690-1783, published in 1997 and supported by the National Endowment for the Humanities. The present book, Dance and its Music in America, 1528-1789, comes therefore as no surprise and fits well into Ms Van Winkle Keller’s distinguished curriculum. This is a study of dance and its music in America, beginning in the early years of colonisation of the New World and ending with the birth and independence of the United States of America in 1789. Before I began reading the book, I mistakenly believed it dealt with dance as an art-form but this is not the case. This is, in fact, a very well researched study of dance as a social feature of everyday life, detailing the various European influences, as well as the dances of the Natives and the traditions of the African slaves and how it all came together. The book is organised geographically, first by region and then by state, in chronological order of discovery and settlement, which means that once in a region the reader will follow the history of each state up to 1789, thus forming a true picture of how dance and its music developed locally, relevant to its various roots. For example the first chapter is about the Spanish Exploration and Settlement, starting with Florida and then the Southwest, i.e. New Mexico, Northern Arizona, Texas, Louisiana and California. The study begins with a rather extensive introduction that explains the purpose of the book, as well as the reasons for its structure and organisation and why it was written. The narrative is fluent and pleasant to read, even for a non-scholar who might be interested in the early history of the USA in general and of dance and its music in particular. It explains well the influences from the various European nations that created the majority of settlements and had the biggest impact in the shaping of the nation, meaning of course Spain, France and England, and it successfully demonstrates the link between social/cultural events and historical developments. It clearly brings across the point on how dance was used (one may be tempted to say "abused"!) to deliberately eradicate the traditions of the natives and to force their integration. All European settlers recognised the psychological power of dance and its music in religious services, the Spanish in particular, to help "educate" and convert the natives. The native population was always taught to play and sing European music and brain-washed that their culture was "uncivilised". Each European nation carefully and consciously used dance and its music as a form of recreation for the people, in social gatherings, but also as a powerful tool for political purposes, to wipe out one culture in favour of the supposedly superiority of another and to impose Christianity on natives and slaves. This makes fascinating reading and will be of interest for scholars as well as people who simply have a desire to learn. What I mean is that, to my mind, Kate Van Winkle Keller’s brilliantly investigated, well written study is aimed as a reference book for researchers and historians but it also makes an interesting, pleasant reading for the amateur person of letters or for the general reader, looking for more than entertainment. The narrative suitably finishes with a short epilogue, stating the birth of the United States as a nation, several crucial dates, as for example the inauguration of George Washington on 30th April 1789, and a brief summary of how dance and music further developed in the country from then on. The objectives of the book, as mentioned above, are well supported by text extracts from historical documents, local newspapers of the time, letters from readers of these papers, dance teachers’ pamphlets and brochures advertising their skills, as well as facsimiles of music sheets with the scores for the various dances, which were published during the years comprised in the study. 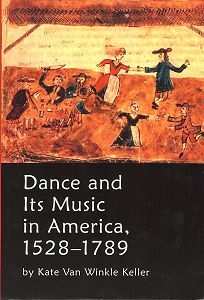 The many illustrations, drawings and sheets with the dance steps, circulated in those years, are also reproduced in the book and contribute to a better understanding of the importance of dance and its music as social forces in the daily life of the colonies and how they impacted and shaped the various states. The historical information concerning the various European nations is accurate and detailed, perhaps, in my personal view, with one minor fault, i.e. the naming of the Iberian Peninsula, on page 42, as Spanish Peninsula. I am not sure if this is the way that it is generally referred to in America or if the author called it "Spanish" because she was writing about the influence of the settlers from Spain, however, she was also referring to an event on the Peninsula and bearing in mind that it is formed (and was already so in the period dealt with in the book) of two distinct countries (Spain and Portugal), with different languages and culture, I would have preferred to see it designated as Iberian Peninsula or Iberia, rather than Spanish Peninsula. A very good feature of the book is the wise and enlightened idea of keeping all notes, as footnotes, at the bottom of each page instead of having them all numbered and then listed at the end of the book. Personally, I find very distracting, annoying even, to have to go back and forward continuously if I want to read the notes and understand the text in full, which often causes me to ignore the notes altogether. In this manner, as simple footnotes, one immediately refers to them, as one does not lose the plot, or in this case, the natural flow of the narrative. To summarise, I found this a very interesting, enriching historical study, proving various important aspects of the use of dance and its music as a political and social weapon, well documented and supported by original images and texts of the period it details, as well as making for enjoyable, fascinating reading.